Tuberculous disease in human beings predominantly affects the Eastern hemisphere of the world. Up to three quarters of the world's population lives in the Eastern hemisphere, and it is here that many live in poorly nourished, overcrowded and in subnormal social conditions. Generally, only typical Mycobacterium tuberculosis is considered to be pathogenic. M. tuberculosis is a slow-growing aerobic organism with a growth-doubling time of about 20 h in conditions favorable to the bacillus. In unfavorable conditions, it will grow only intermittently or remain dormant for a prolonged period to regrow whenever the host defense system becomes deficient. Ideally, diagnosis of tuberculous infection should be confirmed by the demonstration of tubercle bacilli in the skeletal tuberculous lesion. However, this has not been possible in all the cases in any series (Grange 1989, Martin et al. 1989, Moon et al. 2002). In general, the load of mycobacterium in the pulmonary lesions is 10 7 -10 9 , whereas in osteoarticular disease the load is <10 5 . Incidence for positive cultures for acid-fast bacilli (AFB) in osteoarticular tuberculous lesion has been reported by various workers to be between 40 and 88% (Dahl 1951, Dobson 1951, Holmdahl 1951, Wilkinson 1953, Weinberg 1957, Hald 1964, Kemp 1973, Masood 1992). Direct smear examination of tuberculous material obtained during operation or obtained by aspiration of the infected synovium (from joints, bursae and tendon sheaths) or involved lymph nodes or the tuberculous osseous cavities may yield a positive result for tubercle bacilli if the sample contains more than 10,000 bacilli/ml. The best material for microbiological assessment appears to be the centrifuged residue material from a large quantity of abscess, curettings from the walls of cold abscess prior to secondary infection and curetting from the lining of the sinus tracts as close to the base (source) as possible. Mycobacterium culture methods are slow and insensitive enough in bacillary pulmonary tuberculosis; these difficulties get greatly magnified in paucibacillary osteoarticular disease. The central type of vertebral body involvement, "skipped lesion" in the vertebral column and vertebral disease associated with tubercular meningitis, are due to spread of infection along the Batsons perivertebral plexus of veins. Simultaneous involvement of the paradiscal part of two contagious vertebrae in an atypical tuberculous lesion of the spine lends support to insemination of the bacilli through a common blood supply to this region. Simultaneous involvement of the distant part of the spine or the skeletal system and associated visceral lesion suggest spread of infection through the arterial blood supply. Seven percent of the cases of spinal tuberculosis had skipped lesion in the vertebral column and 12% had involvement of other bones and joints (excluding spine), and 20% of the cases on routine investigations had an evidence of tubercular involvement of viscera and/or glands and/or other parts of the skeletal system. Spinal tuberculosis typically involves the initial destruction of the anteroinferior part of the vertebrae. Bacilli may then spread beneath the anterior spinal ligament and involve the anterosuperior aspect of the adjacent inferior vertebra, giving rise to the typical "wedge-shaped" deformity. Further spread may result in adjacent abscesses. Anterior type of involvement of the vertebral bodies seems to be due to the extension of an abscess beneath the anterior longitudinal ligaments and the periosteum. The infection may spread up and down, stripping the anterior and posterior longitudinal ligaments and the periosteum from the front and the sides of the vertebral bodies. The radiographic features of tuberculous osteomyelitis and arthritis are discussed further later. Chronic granulomatous infection of bone by Nontuberculous mycobacteria (NTM) is a rare but recognized clinical syndrome, and usually occurs in the setting of direct inoculation of the organism following trauma, surgical incisions, puncture wounds or injections. Cold abscess is formed by a collection of products of liquefaction and the reactive exudation. The cold abscess is mostly composed of serum, leucocytes, caseous material, bone debris and tubercle bacilli. Following the infection, marked hyperemia and severe osteoporosis take place. Osseous destruction takes place by lysis of bone, which is thus softened and easily yields under the effect of gravity and muscle action, leading to compression, collapse or deformation of the bones. Necrosis also takes place due to ischemic infraction of segments of bones. This change is secondary to arterial occlusion due to thromboembolic phenomenon, endarteritis and periarteritis. Ischemic necrosis has also been recognized as a contributing factor responsible for osseous and vertebral collapse. As a result of ischemic changes, sometimes, sequestration takes place, usually appearing as "coarse sand," and rarely forming a definite radiologically visible sequestrum. Due to loss of nutrition, the adjacent articular cartilage or the intervening disc gets degenerated and may also become separated as sequestra. The intervertebral disc is not involved primarily because it is a relatively avascular structure. The early involvement of paradiscal regions of the vertebrae by the tuberculous process jeopardizes the nutrition of the disc. Such a necrosed or pathologically changed disc may also be invaded by the adjacent infectious process. Clinical: The symptoms of tuberculous bone and joint infections are nonspecific, and the clinical course is often indolent, usually leading to significant delays in diagnosis and resultant bone or joint destruction. Only about 50% of the patients with bone and joint tuberculosis have chest radiographs suggestive of tuberculous infection, further obscuring the diagnosis. Pain or local swelling is the most frequent presenting complaint (Hodgson 1990, Iseman 2000). Fever and weight loss are present in only a minority of the patients. Cutaneous fistulae, abscesses and obvious joint deformity may also be present should the disease have been active for a long time. Like some other forms of extra pulmonary tuberculosis, such as lymph node disease, local symptoms are typically more prominent than systemic constitutional symptoms. Pain on ambulation in the affected weight-bearing joints is common, but nonspecific. In the active stage, patients present with malaise, loss of weight, loss of appetite, night sweats and evening rise of temperature. The spine is stiff and painful on movement, with localized kyphotic deformity that would be tender on percussion. There is a persistent paraspinal muscle spasm around the involved vertebral bodies, which relaxes during sleep, permitting movement between the inflamed surfaces, resulting in typical night cries. A cold abscess may be present. Careful examination may reveal a small knuckle kyphosis on palpation of the spinous process. In the healed stage, the patient neither looks ill nor feels ill, regains his lost weight and there is no evening rise of temperature or night sweats. There is no pain or tenderness in the spine and paraspinal spasm is also absent. The deformity that has already occurred in the active stage persists. Unusually, the first presenting symptom may be neurological deficit. Abscess or sinus can present far away from the vertebral column along the fascial plains or course of the neurovascular bundles. Group A: Early-onset paraplegia - This is the active phase of the vertebral disease, usually within the first 2 yrs of the onset. The underlying pathology in most such cases is inflammatory edema, tuberculous granulation tissue, tuberculous abscess, tuberculous caseous tissue or, rarely, ischemic lesion of the cord. Group B: Late-onset paraplegia - This appears many years (more than 2 years) after the disease has persisted in the vertebral column. Neurological complication may be associated with recrudescence of the disease or due to mechanical pressure on the cord. Underlying pathology in most of the cases is caseous tissue, tuberculous debris, sequestra from vertebral body and disc, internal gibbus, stenosis of the vertebral canal or severe deformity. On an average, involvement of 3.4 vertebrae was reported by Hodgson and Stock  in each patient. A figure of 3.8 was given by Mukopadhyaya and Mishra. The average number reported in children was 3.4 by Martin (1970). The average number of vertebrae involved in each lesion in our series was 3 for children and 2.5 for adults. Spinal tuberculosis is most difficult to recognize radiologically in its early stage. There are four common sites of vertebral tuberculosis: paradiscal type, central type, anterior type, appendicial type. Details of radiological presentation of different sites of cold abscess and its tracking are beyond the scope of this article. Seven percent of the patients may show "skipped lesion." CT and MRI are of special help for posterior spinal disease, tuberculosis of craniovertebral junction and cervicodorsal region, sacroiliac joints and of the sacrum where early lesions do not show in routine X-ray. Various pattern of destruction of vertebral bodies, delineation of the shape, extent and the route of spread of a cold abscess can also be very well visualized by CT scan. MRI has been found to be extremely useful in the diagnosis of tuberculous infection of difficult and rare sites like craniovertebral region, cervico-dorsal region, disease of the posterior element and vertebral appendages and infection of the sacroiliac region. MRI is the most sensitive test for early diagnosis of spinal tuberculosis. Hoffman et al. compared the usefulness of CT and MRI in 25 children with spinal tuberculosis. Radiography provided most of the information necessary for the diagnosis and treatment. Axial CT was the most accurate method for visualizing the posterior bony element. Sagittal MRI best showed the severity and content of extradural compression and helped to differentiate between an abscess and fibrous tissue. The main role of the CT and MRI is in the preoperative evaluation of the small proportion of the patients who require surgical treatment for paraplegia. It has been employed to diagnose the presence of tubercular abscesses in lumbar vertebral disease. It provides composition and quantity of the iliopsoas mass therein. Hence, multiple imaging modalities, such as plain radiographs, CT, MRI, and ultrasound, may all play a role in suggesting the diagnosis and aiding in the recovery of culture material through directed biopsies. Tuberculosis is caused by a bacillus of the M. tuberculosis complex. The most common of the group, M. tuberculosis, grows slowly and stains acid fast because of a highly lipid and peptidoglycan-rich cell wall. Evaluation of tissue samples is accomplished with two main stains: Ziehl-Neelsen and auramine orange fluorescence. Typically, 10 4 -10 6 organisms/ml are required for detection, although concentration techniques can lower this number. The hallmark finding on histopathology is the necrotizing or caseating granuloma. When found, tuberculosis should be presumed until disproven. The number of granulomas observed may vary by biopsy site - high numbers in the lung, low numbers in the bone marrow. Several strategies for the amplification of nucleic acids have been described, including amplification of the nucleic acid target (e.g., PCR, strand displacement amplification, self-sustaining sequence replication), amplification of a nucleic acid probe (e.g., ligase chain reaction, Q [b] replicase) and signal amplification (e.g., branched-probe DNA assay). It is important to understand how PCR-based techniques are used to detect the presence of infectious agents in which there are too few organisms present for detection by other means. This is illustrated by the use of PCR for the detection of Mycobacterium infection. The smear can be negative 50% of the time, particularly in immunosuppressed individuals; cultures can take a long time, which makes the diagnostic approach problematic. PCR can provide both rapid results and an improved diagnostic accuracy of the involved mycobacteria (M. tuberculosis from nontuberculous mycobacteria) in the disease process and lead to the right therapeutic approach in a short period of time. Direct amplification tests have also had a great impact on the rapid diagnosis of tuberculosis. Conventional culture methods for the isolation of mycobacteria generally take several weeks, whereas PCR takes only 24 h.
Commercial amplification assays have been found to have sensitivities of about 90-98% as compared with culture of specimens that are smear-positive for AFB. The performance of these amplifications, however, has been suboptimal for specimens without AFB seen on direct microscopic examination, with reported sensitivities as low as 46%. The specificity of PCR-based assays for M. tuberculosis is excellent at 98%, and sensitivity is at least 80%. Although these assays cannot replace mycobacterial cultures, their ability to rapidly determine the presence of M. tuberculosis directly from the respiratory tract specimens has enabled more rapid institution of effective therapy and implementation of important infection control and public health interventions. Mycobacterium sp probes for the rapid identification of mycobacteria are now widely used to identify acid-fast organisms grown on solid media or in liquid media. The limitation of these NAA is that they give no drug susceptibility information; also, they detect nucleic acids from both living and dead organisms and may be false-positive for active disease. Assays that detect mRNA remain positive only while viable mycobacteria persist, so they are sensitive indicators of treatment response and drug susceptibility. Culture is crucial to provide antibiotic sensitivities to guide therapy. It is important to culture material from deep structures, such as bone, abscesses, synovial fluid or synovial tissue rather than culturing drainage fluid, because these specimens may grow colonizing organisms, such as bacteria or fungi, which may cloud the diagnosis. An older review of the use of synovial fluid culture for M. tuberculosis reported a sensitivity of 79%, whereas synovial tissue culture had a sensitivity of 94%. Lack of sensitivity in smear examination, nonspecificity of radiological findings, extended turn around time of M. tuberculosis culture and difficulties in diagnosing paucibacillary, childhood and extrapulmonary tuberculosis has necessitated the exploration of the utility of immunodiagnosis of tuberculosis as a convenient and cost-effective test to supplement clinical information for definite diagnosis. Indigenous immunoassay systems have explored excretory-secretory ES-31 mycobacterial antigen for the immunodiagnosis of TB. Many a time there is lack of consistent elevation in all the three Ig classes in active infection thus making it more important to determine the ideal antibody isotype assay for reliable diagnosis of tuberculosis and to save the costs of the patient for unnecessary investigations. The cell count and biochemistry findings from tuberculous joint fluids, although typical of inflammatory arthritis, are not specific for a mycobacterial infection. Moderately elevated leukocyte counts with a neutrophilic predominance, low glucose and increased protein are typical. In the active stage of the disease, a relative lymphocytosis, low hemoglobin and raised erythrocyte sedimentation rate are often found. Raised ESR, however, is not necessarily a proof of activity of the infection. Its repeated estimation at 3-6-month intervals gives a valuable index to the activity of the disease. This test is of limited use in determining active disease, however, and is best used for screening for latent infection in high-risk populations. Although skin test positivity has been reported to be as high as 90% in immunocompetent patients with bone and joint tuberculosis,  positivity neither confirms nor excludes the diagnosis. In debilitated or immunocompromised patients, the sensitivity of the test decreases substantially, making it largely irrelevant in making the diagnosis of tuberculosis disease in this population. Tuberculin skin testing is not useful in diagnosing disease caused by NTM. Preantitubercular era: Hippocrates (450 BC) and Galen (131-201 AD) tried to correct kyphotic deformity due to tuberculosis of spine, by manual pressure, traction and mechanical appliances, but failed. The orthodox conservative treatment advocated recumbency, immobilization by means of body cast, plaster beds and braces. Rest as fundamental of treatment was strongly advised and practiced by John Hilton and Hugh Owen Thomas. In general, results of these conservative treatments were disappointing. Hence, operative procedures were developed either for the treatment or for the prevention of paralysis in tuberculosis of the spine. Laminectomy and Laminotomy: Chipault in 1896 was the first to use laminectomy in Potts paraplegia and later Fraser performed laminotomy, but, finally in 1937, abandoned the operation altogether as the late results were disappointing. Costo-transversectomy: Menard in 1894 developed costotransversectomy, which fell into general disrepute, because of the high incidence of sinus formation and of secondary infection. Posterior mediastinostomy: Obalinski performed the procedure for the evacuation of tuberculous paravertebral abscess. Calve's operation: Calve in 1917 devised a method to aspirate the contents of an abscess without sinus formation. Lateral rhachiotomy of Capener: Norman Capener in 1933 devised lateral rhachiotomy, which was a direct attack on the solid compressing agent anterior to theca, whereby he excised a part of the lamina and pedicle from one side to enter the spinal canal anteriorly and remove the cause of pressure on the cord. 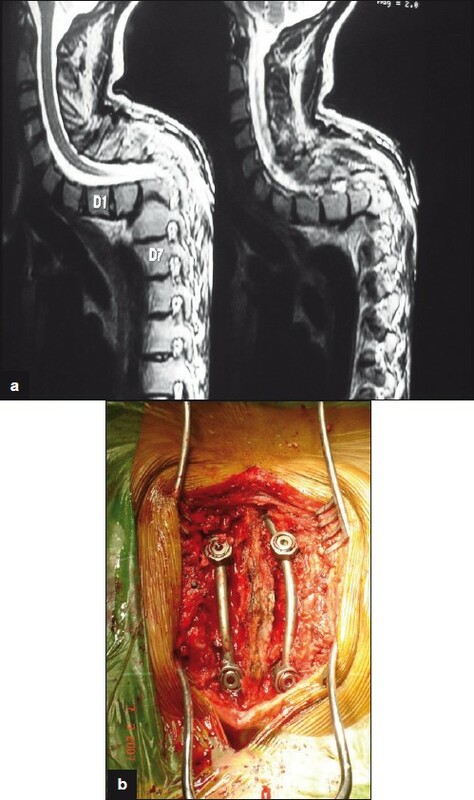 Anterolateral decompression of Dott and Alexander: Dott and Alexander evolved the operation of anterolateral decompression, a modification of Capener's operation, the approach being a little more anterior and involving removal of a part of the body of the vertebra to gain access to the spinal canal; no part of the lamina was removed. Posterior decompression with posterior spinal arthrodesis: Because of the results of the operations on the diseased parts of the spine, Albee (1911, 1930) and Hibbs (1912, 1918) introduced the operation of posterior spinal fusion. Such operations were carried out 1911 onwards and were developed by many surgeons to shorten the period of immobilization in the bed and to provide a permanent internal stability to the tuberculous spine to avoid recurrence of the disease and development of paraplegia. Over the years it became increasingly obvious that posterior fusion did nothing to the diseased area where pus, debris and necrotic bone remained enmeshed and encysted in dense fibrous tissue, where the organisms remained alive, sometimes mildly active, in other cases dormant only to flare up at any chance or provocation. The availability of the antitubercular therapy, however, improved the results of nonoperative conservative treatment and posterior spinal fusion. Effective chemotherapy has been available for the treatment of TB for over 50 years now. In the World Health Organization (WHO)-International Union Against Tuberculosis and Lung Disease (IUATLD) Working Group Global Anti-Tuberculosis Drug Resistance Surveillance (1994-1997), the incidence of MDR TB in Delhi was found to be 14%, of which primary multidrug resistance was only 1.4%, indicating that most of MDR TB is acquired as a result of poor chemotherapy. Culture of M. tuberculosis is the gold standard for the diagnosis of TB. Management of TB: Essential anti-tuberculosis (ATT) drugs Isoniazid (H), Rifampicin (R), Ethambutol (E), Pyrazinamide (Z) and Streptomycin (S) are the essential first-line anti-tuberculosis drugs. The anti-TB regimen consists of two phases: an initial intensive phase (IIP) and a continuation phase (CP). Best-effective short-course chemotherapy (SCC) for the treatment of TB, for adults and children, for pregnant and lactating females, for cases associated with diabetes mellitus and HIV infection, for cases with preexisting liver diseases (but normal liver functions) and mild renal failure is 2EHRZ, 4HR given daily or thrice weekly. Higher-dose SCC intermittent therapy given thrice weekly (2E3H3R3Z3, 4H3R3) has now been advocated by WHO and implemented by the Revised National TB Control Programme. India had a National Tuberculosis Programme (NTP) in place from the '60s, following epidemiological assessment of the situation during 1955-1958. In 1993, the NTP in India was strengthened in the form of Revised National Tuberculosis Control Programme (RNTCP). Following a decade of efforts to test run the RNTCP and then implement it in the field conditions in India, the programme entered into the phase of substantial expansion. More than 450 million people are already reported to be under the directly observed treatment short course (DOTS) strategy under the RNTCP by the end of 2001. DOTS is where the patient takes the drugs under the direct observation (DO) of a health worker to ensure regularity of consumption of drugs. Fixed-dose combination (FDCs) drugs consisting of two or three ATT medications, provide a realistic and welcome alternative to DO, which minimize the opportunity for a patient to selectively take only a single medication. All drugs, i.e., rifampicin, isoniazid, ethambutol and pyrazinamide, can be used during pregnancy. Streptomycin is not given due to ototoxicity to the fetus. Prophylactic pyridoxine in the dose of 10 mg/day is recommended along with ATT. The drug regimen is same as in nondiabetics. Strict control of blood glucose is mandatory. Also, doses of oral hypoglycemic agents may have to be increased due to the interaction with rifampicin. Prophylactic pyridoxine is indicated. Dosages may have to be adjusted according to the creatinine clearance, especially for streptomycin, ethambutol and isoniazid. In acute renal failure, ethambutol should be given 8 h before hemodialysis. Rifampicin-containing regimens are avoided as rifampicin causes increased clearance of cyclosporine. In stable disease with normal liver enzymes, all ATT drugs may be used, but frequent monitoring of liver function tests is required. If patients are fed by Ryle's tube or gastrostomy tube, usual doses and drugs may be powdered and administered, avoiding feeds 2-3 h before and after the dose. In cases where enterostomy has been performed or parenteral nutrition is being used, intramuscular streptomycin and isoniazid and intravenous quinolones may be used, with switching to oral therapy once oral feed is resumed. In the early stages, the presentations of TB in TB-HIV coinfection is the same as in HIV-negative, but in the late stages, extrapulmonary and dissemination are common. The usual short-course chemotherapy is indicated in HIV-positive patients. The response is usually good, but relapse is frequent. After initiating ATT or antiretroviral therapy (ART), worsening of preexisting lesions or appearance of new lesions is seen, the "paradoxical response" or "immune reconstitution phenomenon." Multidrug-resistant TB can occur due to poor compliance to ATT due to behavioral pattern, increased incidence of side-effects and malabsorption of drugs due to associated diarrhea. ART for HIV, containing protease inhibitors (PI) and nonnucleoside reverse transcriptase inhibitors (NNRTI), cannot be used along with R, as R induces metabolism of PI and reduces the efficacy. The various options are: (i) to postpone ART, (ii) to use no PI or NNRTI containing antiretroviral combinations, (iii) to use certain PI/ and/or NNRTIs with modification in doses, iv) Efavirenz (EFZ) or Saquinavir with Ritonavir, without the need to adjust the doses and (v) to use non-R regimens, e.g. 2SHEZ + 10HE. It is rather difficult to strictly compare the results of various series treated by nonoperative and operative treatment as the clinical material varies from center to center. Excisional therapy has been practiced by many workers for all cases of tuberculosis of spine, with excellent results when combined with antitubercular drugs. The incidence of healing has been 80-96%. Excisional surgery evidently evacuates tubercular pus and debris, removes sequestra of disc and bone and opens up new vascular channels in ischemic areas thus leading to reduction of general toxemia, reduction of the total time of healing of the local lesion and probably improves the quality of healing, especially in cases with extensive destruction and sequestration. On the other hand, there are certain cases of tuberculosis of spine that do not have extensive destruction and sequestration which would heal without surgical intervention. Figure 2: a-d: 30 years old female presented with 4months history of back pain with significant paraparesis and bladder involvement. She was treated with anterior decompression bone grafting and stabilization. Figure 3: a-b: this is 45 years old female presented with significant increasing backache for 6 months was on antitubercular medicines. She was stabilized with single staged front and back procedure with pedicle screws, expandable cage and bone graft. Neurological complication that failed to respond to conservative therapy or too advanced therapy. Progressive bone destruction in spite of chemotherapeutic regime. Failure to respond to conservative therapy. Prevention of severe kyphosis in young children with extensive dorsal lesion. A period of observation of about 3-4 months seems to be enough to judge these features. Marked increase in the size of paravertebral abscess in spite of rest and a chemotherapeutic regime. Recrudescence of the local disease. Pain in the spine due to mechanical instability. Debridement ± decompression ± fusion. Laminectomy has no place in tuberculosis of spine except for extradural granuloma/tuberculoma presenting as "Spinal tumor syndrome" or a case of old healed disease (without much deformity) presenting with secondary "vertebral canal stenosis" or posterior spinal disease. Among the operated cases of tubercular lesions, kyphosis angle increased >30 degrees in 4%, 10-30 degrees in 19% and <10 degrees or static in 77%. The deformity in the operated cases became stable by about 18 months in a majority of the cases. Rajasekaran and Shanmugasundaram, 1987,  calculated that future angle (Y) of kyphotic deformity in tuberculosis of the spine could be reasonably predicted by using a formula Y = a + bx, where x is the initial loss of vertebral bodies (height in cm) and a and b are constants 5.5 and 30.5, respectively. Kyphotic deformity may be unstable and progressive, particularly in childhood, and they believed that a severe deformity in the presence of active disease should be an absolute indication for decompression, correction and stabilization, as late reconstruction of tuberculous kyphos was a difficult and dangerous procedure. Any significant correction of fixed kyphotic deformity involved many staged operations; the operative procedures required are anterior at the site of disease, osteotomy at the posterior elements at the deformity and halopelvic or halofemoral traction posteriorly. Treatment of paraplegia in severe kyphosis is anterior transposition of the cord through laminectomy. Laminectomy was performed first, then enough spinal nerve roots were divided on both sides to permit rotation and retraction of the theca so that enough bone from the front of the vertebral canal could be removed. Excellent removal of internal kyphosis can be achieved through the anterolateral approach to permit the cord to lie in a relaxed anterior position. 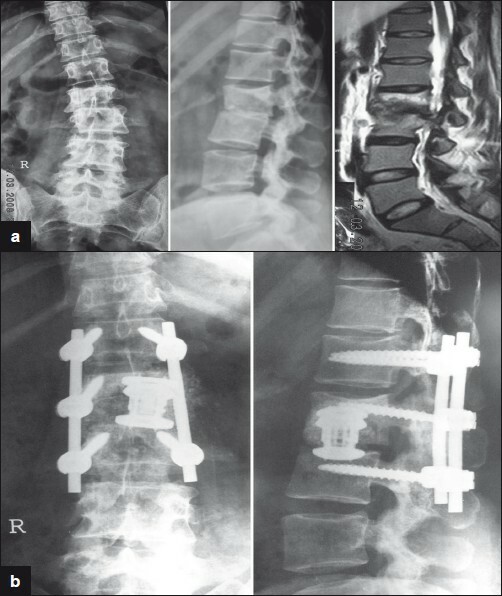 [[Figure 4]a-b] Rajasekaran (2002) suggested stabilization of the spine posteriorly followed by anterior debridement and bone grafting in the active stage of the disease. In the healed stage with rigid deformity, he suggested anterior debridement first to be followed by posterior instrumentation and anterior fusion. Detailed discussion on the special considerations for different anatomical segments is beyond the scope of this article. 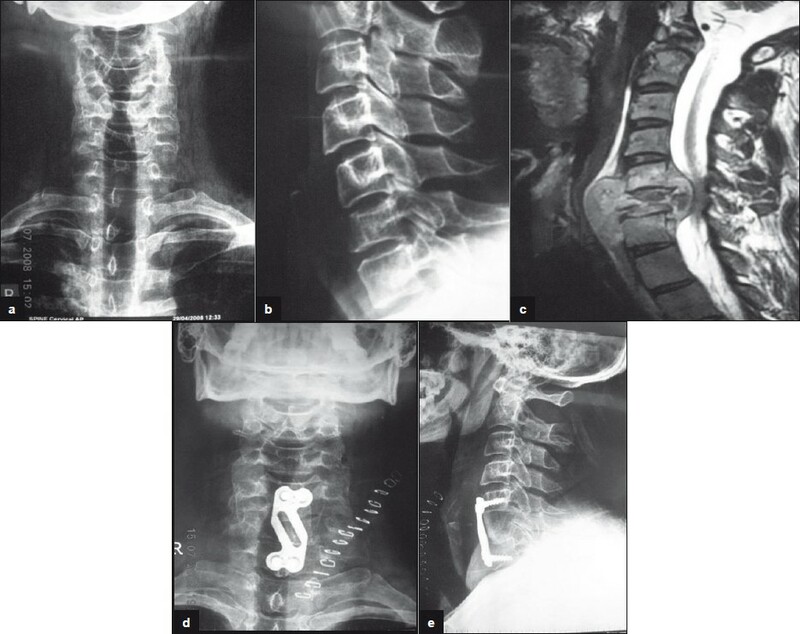 Figure 5: a-c: 52 years old male presented with increasing pain and deformity of dorsal spine after taking Antitubercular drugs for 5 months. He was treated with endoscopic corpectomy, pyrmesh cage with bone grafting and single screw-rod construct. Clinical picture shows small scars 3 months after surgery. Similarly, in our retrospective study,  we evaluated 26 patients (nine females and 17 males with the mean age of 38.34 years) with spinal tuberculosis, who underwent single-stage anterior radical debridement, autologous bone grafting with or without Pyramesh cage and anterior instrumentation. The average follow-up period was 25.96 months (12-40 months). A solid fusion was achieved in all cases at an average duration of 7.34 months (6-9 months). Depending on the use of the cage with rib/iliac crest graft, isolated iliac and rib graft, measurement of the kyphotic deformity was performed separately in each group at regular intervals. Nineteen patients in whom Pyramesh cage along with rib graft/iliac crest was used showed excellent results in deformity correction from an average of 23 degrees (10-36) on admission to an average of 3 degree after surgery, which, at the time of fusion, was 4.5 degree. Seven patients in whom isolated iliac/rib graft was used showed good results in the initial postop period, but gradual loss of correction was observed on follow-up. The average deformity of 19 degree (12-25) preoperatively was corrected to 3.5 degrees (2-6). This group showed significant loss of correction at final follow-up, and average deformity at the time of fusion was 11 degrees. There was no recurrence of the tuberculous infection in any of the patients. Hence, we recommend the single-stage anterior instrumentation, which provides an effective correction of the deformity, stable alignment and solid fusion. Use of cage with iliac/rib graft provides better correction as well as maintenance of correction in comparison with the isolated iliac crest or rib graft. 1. Tuli SM. Textbook- Tuberculosis of the skeletal system (Bones, Joints, Spine and Bursal sheaths). 3rd ed. ;New Delhi: Jaypee Brothers; 2004. 2. Farer LS, Lowell AM, Meador MP. Extrapulmonary tuberculosis in the United States. Am J Epidemiol 1979;109:205-17. 3. Davies PD, Humphries MJ, Byfield SP, Nunn AJ, Darbyshire JH, Citron KM, et al. Bone and joint tuberculosis: A survey of notifications in England and Wales. J Bone Joint Surg Br 1984;66:326-30. 4. Jutte PC, van Loenhout-Rooyackers JH, Borgdorff MW, van Horn JR. Increase of bone and joint tuberculosis in The Netherlands. J Bone Joint Surg Br 2004;86:901-4. 5. Houshian S, Poulsen S, Riegels-Nielsen P. Bone and joint tuberculosis in Denmark: Increase due to immigration. Acta Orthop Scand 2000;71:312-5. 6. Hoffman EB, Crosier JH, Cremin BJ. Imaging in children with spinal tuberculosis: A comparison of radiography, computed tomography and magnetic resonance imaging. J Bone Joint Surg Br 1993;75:233-9. 7. Weaver P, Lifeso RM. The radiological diagnosis of tuberculosis of the adult spine. Skeletal Radiol 1984;12:178-186. 8. Omari B, Robertson JM, Nelson RJ, Chiu LC. Pott's disease: A resurgent challenge to the thoracic surgeon. Chest 1989;95:145-50. 9. Kumar K, Saxena MB. Multifocal osteoarticular tuberculosis. Int Orthop 1988;12:135-8. 10. Griffiths JF, Kumta SM, Leung PC, Cheng JC, Chow LT, Metreweli C. Imaging of musculoskeletal tuberculosis: a new look at an old disease. Clin Orthop Relat Res 2002;398:32-9. 11. Williams GT, Williams WJ. Granulomatous inflammation: A review. J Clin Pathol 1983;36:723-33. 12. Griffiths DL, Seddon HL, Roaf R. Potts paraplegia. London: Oxford University Press; 1956. 13. Goel MK. Treatment of potts paraplegia by operation. J Bone Joint Surg 1967;49:674-81. 14. Tuli SM. Judicious management of tuberculosis of bone joint and spine. Indian J Orthop 1985;19:147-66. 15. Kumar K. Tuberculosis of spine: Natural history of disease and its judicious management. J West Pac Orthop Assoc 1988;25:1-18. 16. Hodgson AR, Stock FE, Fang HS, Ong GB. 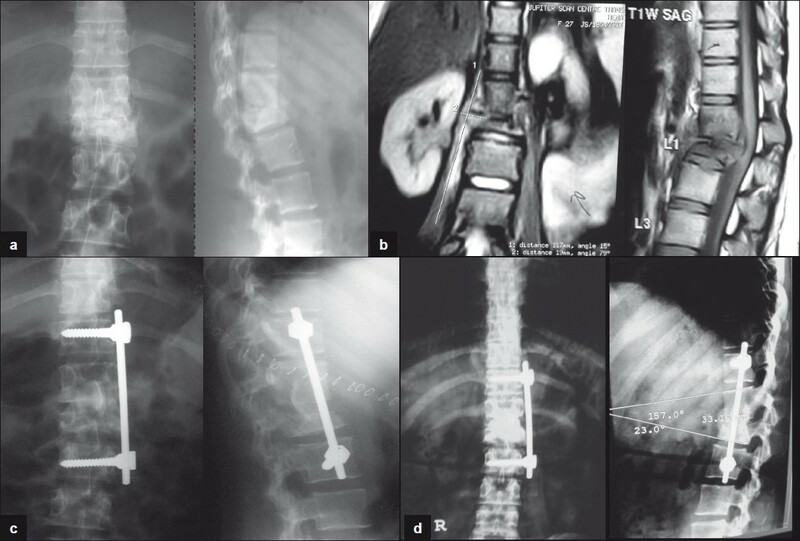 Anterior spinal fusion: The operative approach and pathological findings in 412 patients with Pott's disease of spine. Br J Surg 1960;48:172-8. 17. Mukopadhyay B, Mishra NK. Tuberculosis of the spine. Indian J Surg 1957;19:59-81. 18. Centers for Disease Control and Prevention. Controlling tuberculosis in the United States: Recommendations from the American Thoracic Society, CDC, and the Infectious Diseases Society of America. MMWR 2005;54(No. RR-12):1-81. 19. Cuchacovich R. Clinical applications of the polymerase chain reaction: An update. Infect Dis Clin North Am 2006;20:735-58. 20. Bhatia AS, Kumar S, Harinath BC. Immunodiagnosis of tuberculosis: An update. Indian J Clin Biochem 2003;18:1-5. 21. Iseman MD. A clinician's guide to tuberculosis. Philadelphia: Lippincott, Williams, and Wilkins; 2000. 22. Berney S, Goldstein M, Bishko F. Clinical and diagnostic features of tuberculous arthritis. Am J Med 1972;53:36-42. 23. Wallace R, Cohen AS. Tuberculous arthritis: A report of two cases with review of biopsy and synovial fluid findings. Am J Med 1976;61:277-82. 24. Pertuiset E, Beaudreuil J, Horusitzky A, Lioté F, Kemiche F, Richette P, et al. Epidemiological aspects of osteoarticular tuberculosis in adults: Retrospective study of 206 cases diagnosed in the Paris area from 1980 to 1994. Presse Med 1997;26:311-5. 25. Somerville EW, Wilkinson MC. Girdlestone's tuberculosis of bone and joints. 3rd ed. London: Oxford University Press; 1965. 26. Tuli SM. Severe kyphotic deformity in tuberculosis of spine: Current concepts. Int Orthop 1995;19:327-31. 27. Chen WJ, Wu CC, Jung CH, Chen LM, Niu CC, Lai PL. Combined anterior and posterior surgeries in the treatment of spinal tuberculous spondylitis. Clin Orthop 2002;398:50-9. 29. Tuli SM. Results of treatment of spinal tuberculosis by middle path regime. J Bone Joint Surg 1975;57:13-23. 30. Srivastava TP. Outcome of patients of spinal tuberculosis treated without surgery. Unpublished data Banaras Hindu University, 1980-81. 31. Rajasekaran S, Shanmugasundaram TK. Prediction of the angle of Gibbus deformity in tuberculosis of the spine. J Bone Joint Surg 1987;69:503-8. 32. Medical Research Council. A 10 years assessment of a controlled trial comparing debridement and anterior spinal fusion in the management of tuberculosis of spine in patients on standard chemotherapy in Hong Kong: VIII report. J Bone Joint Surg 1982;64:393-98. 33. Laheri VJ, Badhe NP, Dewnany GT. Single stage decompression, anterior interbody fusion and posterior instrumentation for tuberculous kyphosis of the dorso-lumbar spine. Spinal Cord 2001;39:429-36. 34. Dusmet M, Halkic N. Corpataux JM. Video-assisted thoracic surgery diagnosis of thoracic spinal tuberculosis. Chest 1999;116;1471-2. 35. Sundararaj GD, Behera S, Ravi V, Venkatesh K, Cherian VM, Lee V. Role of posterior stabilisation in the management of tuberculosis of the dorsal and lumbar spine. J Bone Joint Surg Br 2003;85:100-6. 36. Suryaprakash Nagariya, Prasad Patgaonkar, Sachin Chhabra, Vinod Agrawal, Jorg Franke. Single stage anterior decompression and instrumentation for spinal tuberculosis J. Spinal Surg. 2010 October; 2(2): 373-382.